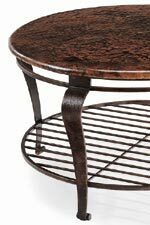 Add a rustic accent to your home with this Round Cocktail Table featuring a wrought iron base with curved legs and a metal slat shelf for storage, along with a hammered copper top finished in a dark brown with black undertones. The Clark Round Cocktail Table by Bernhardt at Thornton Furniture in the Bowling Green, Alvaton, Glasgow, Scottsville, Franklin area. Product availability may vary. Contact us for the most current availability on this product. Warranty Bernhardt Furniture Company warrants its wood products to be free from defects in material and workmanship under normal use and service for a period of five (5) years from the date of shipment to the dealer. With bases constructed from curving wrought iron and rustic hammered copper tops in a dark brown finish with black undertones the Clark collection is the prefect accent to your home providing functional features such as metal slat shelves with a unique style. The Clark collection is a great option if you are looking for Casual furniture in the Bowling Green, Alvaton, Glasgow, Scottsville, Franklin area. Browse other items in the Clark collection from Thornton Furniture in the Bowling Green, Alvaton, Glasgow, Scottsville, Franklin area.